GREEN BAY, WI - Jabre Lolley rushed for three touchdowns and the Arizona Rattlers' defense forced three turnovers as the Rattlers overwhelmed the Green Bay Blizzard today, 51-21. Arizona, which won the 2017 United Bowl, opens the season 1-0, while the Blizzard fell to 0-1. The contest was the fourth and final game of opening weekend of the 2019 Indoor Football League season. Arizona's defense scored first, on a safety, when they sacked Blizzard quarterback Justin Billiot in the end zone. After each team turned the ball over, the Rattlers drove down and scored on an eight-yard run by Jabre Lolley. Green Bay pulled to within 9-7 when Leonorris Footman, in for a struggling Billiot, hit Kezlow Smith for a 15-yard score. The Rattlers came back with a four-yard pass from Jeff Ziemba to Lolley to go back up by two scores, but the Blizzard came right back with a 35-yard touchdown bomb from Footman to B.J. Hill. Ziemba's four-yard run with 7:45 left in the half put the Rattlers up 23-14. The Blizzard nearly scored as time expired in the half, but Hill's long reception was just short of the end zone. The play was actually reviewed to see if there was time on the clock when Hill went out of bounds, but the video had no clock to reference and the half was called. The Rattlers led by nine at the break. Verlon Reed, Jr., the 2017 IFL Offensive Rookie of the Year, replaced Ziemba in the second half. Reed scored on a 12-yard run with 9:38 left in the third quarter to put the Rattlers up 51-21. Green Bay attempted a fake field goal, but was stuffed. The Rattlers went on to score and take a 37-14 lead at the end of three quarters. Footman tossed a one-yard touchdown to Smith and the Blizzard were back to within 16 at the 13:47 remaining. Reed's seven-yard touchdown scamper a couple minutes later extended the Rattlers' lead to 44-21. Lolley all but sealed it for Arizona with his third touchdown run of the game with 1:02 left in the game. The Rattlers held the edge in total offense, 277 yards to 210 yards, including 132 yards to 86 in the rushing game. Arizona was penalized 12 times for 98 yards, while Green Bay was flagged six times for 41 yards. Ziemba went 10 of 13 for 97 yards with a touchdown and an interception. Lolley rushed 14 times for 88 yards and a trio of touchdowns, and added a receiving touchdown. Reed added a pair of touchdowns off 30 rushing yards. Anthony Amos had four catches for 61 yards, while Dezmon Epps caught three passes for 51 yards. Allen Chaoman, Devin Cockrell and Phillip Henry each intercepted passes for the Rattlers. Joshua Gordon recorded three sacks, and Ricky Wyatt Jr. also had a sack. Footman showed promise after entering the game late in the first quarter. he completed 12 of 26 passes for 147 yards with three touchdowns and two interceptions; both coming in garbage time. Footman also rushed 10 times for 85 yards. B.J. Hill led the receiving group with five receptions for 94 yards and a touchdown, and Kezlow Smith caught three passes for 23 yards and two scores. Marquez Gollman's nine tackles, fumble recovery and two interceptions paced the defense. Jadar Johnson contributed nine tackles and Truett Box had a sack. 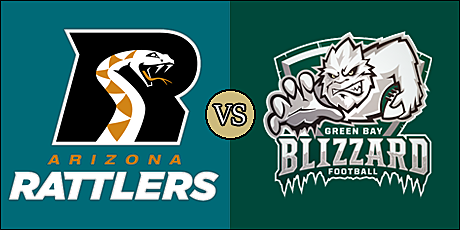 The Blizzard are next in action on March 1 when they host the Nebraska Danger at 5:05 p.m. (pacific). The Rattlers are at home on March 3 as they host the Cedar Rapids River Kings at 2:05 p.m. (pacific). I had a tough time getting into this one. I would say it was more competitive than the score shows. Arizona looked pretty good, but they had a lot of penalties. I would say Green Bay needs to stick with Footman at QB. He just seems like he's more of a dual threat guy.